Magento 2 was launched amidst a lot of hype. The newest version of the tool promises more than just what its predecessor could not offer to its wide-ranged client base. But after Magento 2 was received with too much skepticism, when it finally released in 2015, the software has improved and upgraded itself by leaps and bounds. Today, 25% of the entire E-commerce website in the world uses some or the other services related to Magento. Irrespective of its reputation as one of the most trusted platforms, there are still businesses out there who are skeptical to use Magento’s services. Below is a comparison between Magento 1 and Magento 2 and here is why you should consider using Magento 2. – Magento 2 allows 50% faster page loading compared to Magento 1. This means the online traffic on your website has a less chance of bouncing away due to longer loading time. – Be it your product & services page, category page or landing page; Magento 2 loads your page in nearly half the time of Magento 1. – It can also take 117% more check-out traffic than the previous version. – It can handle 150% more page views per hour – nearly 2.1 million more than Magento 1. Magento 2 also enables image compression with inbuilt tools – a feature that demanded manual editing in the previous version. Magento 2 also ensures superior security compared to Magento 1. This is due to the Strengthened hashing algorithm which provides protection against dictionary attacks. Magento 1 did not have a feature like this. – Magento 2 Admin panel is more responsive, quicker and aware. It helps the admin to navigate with much ease, search info and run the store effectively. – There are a plethora of options available for like lifetime sales, recent orders, top-viewed items – all of which helps you monitor your business up close. – Other options let you check revenue taxation, shipping, stock, top-sellers and customer database. – Latest product creation tool gives a step-by-step guide which helps upload products easily. – Let’s you manage tasks like adding or removing columns from product listings. – Effective content section lets you fill information and details like company bio. – Integrating tools used in Magento 1 to Magento 2 is easier. – Data transferring from Magento 1 to Magento 2 is a reality with Data Migration Feature. – Magento 2 Luma is a more appealing display layout than the previous edition’s default theme. – Ultra-responsive web design which enables users to access any website using mobile, tablets, PC or laptops. – Quick frontend responsiveness allows visitors to see the main page without the stress of going through an ever-buffering page. – Easier and faster check-out options. Magento 2 is smart enough to detect registered user by analyzing the email id. Additional ‘Guest check-out’ option is available too. – The simpler check-out registration process for new users. – Summary with product details in the shopping cart will allow users to better understand their buying options. – A secure payment gateway means the product billing will be sent to the service providers and the users can pay using the out-of-the-box method. 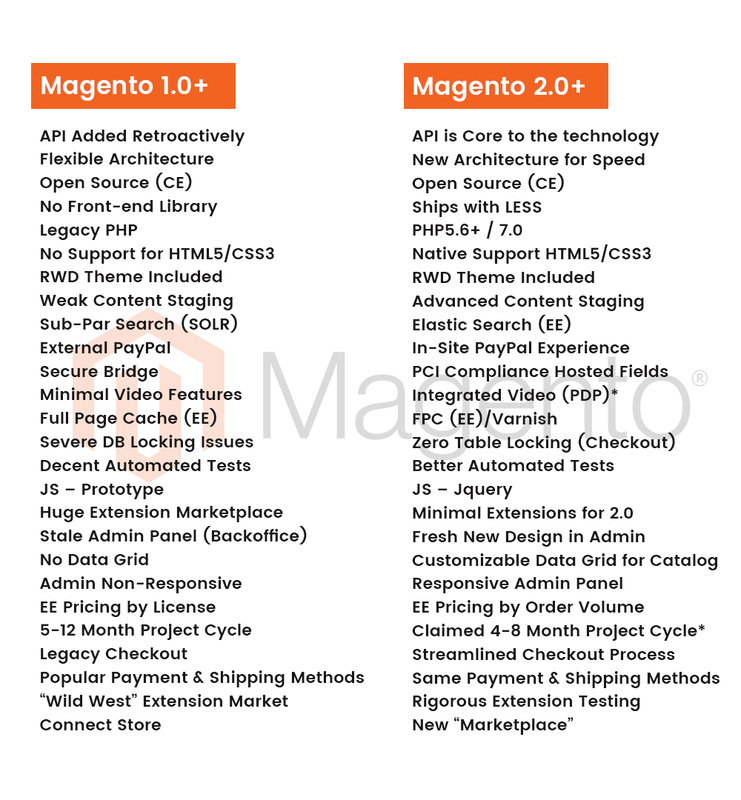 Magento 1 v/s Magento 2 – What’s different? Why should I be bothered? If you are a merchant, a business person or someone who simply wants to sell their products online and engage the web with your brand. Magento 2 CONCERNS YOU! Not only has the mandatory migration from Magento 2 to Magento 1 made Ecommerce better, but millions of businesses worldwide have already started by the gun. If you are not migrating today or getting a Magento 2 website, then your business is surely missing out on a lot of things. Shopify v/s Magento CE – Weighing the two giants! Contact us now to start your project. We're as excited as you are! Follow Bliss Web Solution Pvt. Ltd.
Bliss Web Solution Pvt. Ltd.
S.G.Highway, Ahmedabad - 380 054. © 2019, Bliss Web Solution Pvt. Ltd. All rights reserved.